Unless you’ve positioned yourself snugly under a rock for the past few years, you’ve almost certainly heard of Airtasker. Perhaps you’ve seen their offbeat Like A Boss TV ads. Perhaps you’re one of the almost 2 million registered users of the platform as of mid-2018. Whatever the case, it’s fair to say that the company’s star is quickly rising. So today we’re going to look at all you need to know about an Airtasker career. There’s nothing more exciting as a tech professional than being involved in a company that’s making serious waves. So what would it mean to embark on an Airtasker career? And what specific Airtasker jobs are currently available? Let’s take a closer at this home-grown success story, and see what life within the office walls is all about. What is Airtasker all about? The system is beautifully uncomplicated. The users of the platform post a job that needs doing, and this could quite literally be anything – tech assistance, lawn mowing, video editing or painting, to name but a few – then applicants bid for the right to do the work. Once the user is happy with an applicant, the platform facilitates communication and payment between the two parties, with Airtasker taking a fee of 15% on all jobs. It might be a simple premise, but it’s one that has resonated with the market in a serious way. Airtasker now creates over $15 million worth of jobs every month, with its best workers (called ‘Taskers’ by the company) pulling in annual earnings that push well into triple figures. The company was founded in 2012 by Tim Fung and Jonathan Lui, and is headquartered in Sydney. It currently boasts an in-house workforce of over 120, with its headcount having grown by 148% in the last two years. Airtasker has positioned itself at the very crest of the gig economy wave, and growth seems unlikely to slow any time soon. What is it like working at Airtasker? This is a unique business, as it employs two very different types of worker. The workers who complete the tasks posted by users on the platform (Taskers). The in-house team who run the platform itself. Let’s tackle worker #1 first. What is life like as a tasker? Well, as a freelancer/sole trader, you’ll find yourself largely in control of your own destiny. You choose which jobs to apply for and the amount you’d like to bid for each. Airtasker facilitates communication and payment between you and the user, as well as providing third party liability insurance. In return the platform takes a commission of 15% on all jobs. The flexibility of this type of work is appealing to many, although it is prone to fluctuation, and can lack the security and consistency of traditional full time employment. Is it right for you? Those who are interested needn’t die wondering – sign-up is entirely free! And what of worker #2? For tech professionals looking join a fast-paced, dynamic and flourishing company, few Australian businesses are more enticing than Airtasker. Listed by The Martec as one of the 50 Australian Tech Companies Everyone Wants to Work For, the company offers all the staple perks expected of modern tech businesses, plus so much more. Employees enjoy free Airtasker credits, allowing them to liberally utilise the platform that they work day and night on. A fitness allowance and upskill training allowance helps workers to develop themselves, a generous parental leave policy gives new mums and dads the time they need with their newborn, and interstate and international hires are granted a relocation allowance to ease the stress of moving. The company enjoys a particularly good rating on Glassdoor, with current and former employees rating it 4.6 stars as a workplace. But who better to talk you through the perks and pitfalls of working at Airtasker than those who live and breathe it every day? Airtasker sells itself as a workplace that will make you feel as though you affected someone, somewhere, for the better, each and every day. People matter to Airtasker – the company values every single employee for the unique skills and insight that they bring to the table, and understands that they are far more than just means to an end. Hard work is rewarded, and team success is celebrated. As a growing company working in an interesting space, Airtasker attracts some of Australia’s most talented tech professionals. Many designers, engineers and general doers have started their careers at Airtasker, with a remarkable proportion remaining there to this day. Listed by The Martec as one of the 18 Top Tech Companies Hiring in Sydney Right Now, it’s little wonder why seats within the office prove so enticing and so sticky. Most of the careers within Airtasker centre on tech, with product design, management and engineering making up the bulk of the headcount. While the company prefers to bring people in at a junior level, develop talent in-house and promote internally, senior roles must be filled by qualified external talent from time to time. 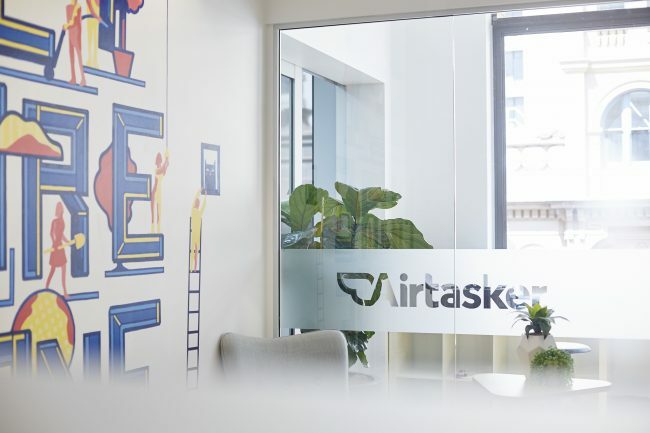 With the brand currently developing plans for large-scale international expansion, the possible career paths within Airtasker are expected to expand ever further in the coming years. International travel and even relocation is a real possibility for employees who possess the required enthusiasm and skill set. A cool, modern tech start-up needs a cool, modern tech start-up office. Bean bags, free snacks and street-art covered walls are almost contractual these days. Thankfully Airtasker’s Sydney HQ does not disappoint in any of these respects. 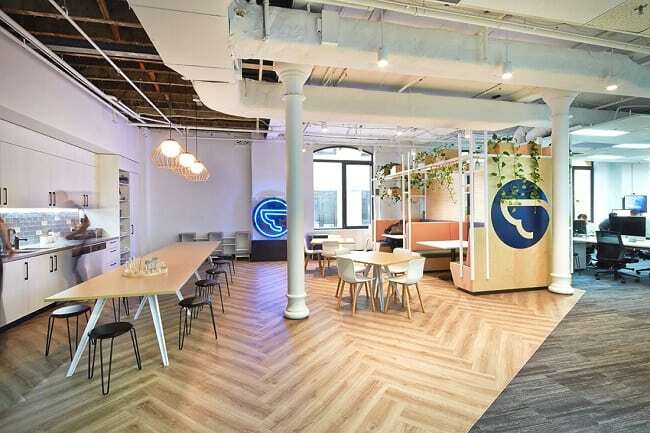 In fact, The Martec recently named it as one of The 18 Coolest Offices in Australia. 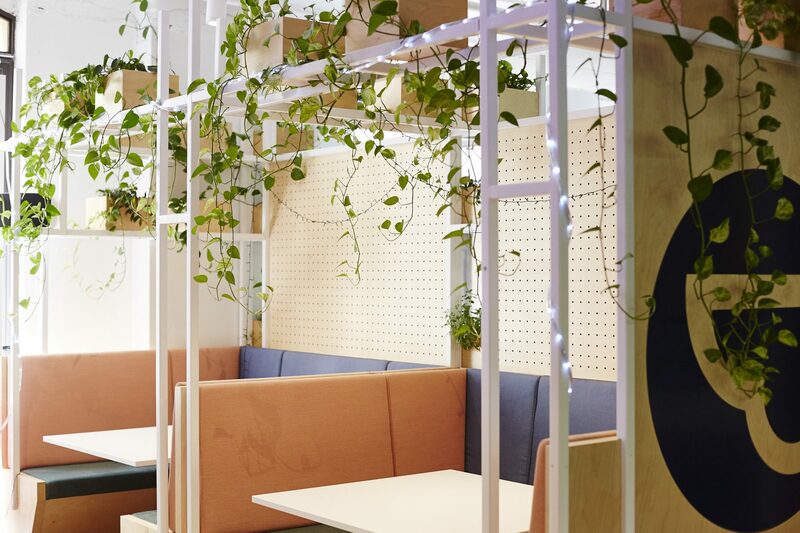 When Siren Design took on the Airtasker office design job, they had three words ringing in their ears – get more done. Airtasker’s famous tagline served as the perfect inspiration for the layout, with every element aimed at making work more efficient, more effective, more fun, and just plain better. The floorplan is particularly open, fostering teamwork and collaboration, but quiet nooks abound for those feeling the heat and requiring silence. The kitchen/breakout area has been designed to feel like a home away from home, and features a huge communal bench that always seems to transform into a beer holder and card table come Friday night. Hungry and thirsty staff can find sustenance in a fridge that is always stocked with a healthy array of snacks and refreshments – alcoholic and otherwise. The office enjoys a wealth of natural light, which is enhanced by the bright and airy colour palette used throughout. Highlights from neon Airtasker logos and bespoke wall murals (designed and painted by workers found on the company’s own platform) add interest, while the exposed ceiling, ductwork and supports give the office a salt of the earth feel that is so often lacking in the headquarters of tech giants. Airtasker is a company that has built a brand around getting things done. Happily its own offices are ready to help it do just that. Are you a tech professional looking for a change of scenery? Do you align with the Airtasker philosophy, and like what you’ve seen here? Click here for a full list of current Airtasker jobs and kick-start your Airtasker career.